Georges William Hill, Le Lion de Belfort, 1897. Granit. Square Dorchester. Montréal. Photo : Alexandre Nunes. The son of a marble carver, George W. Hill learned the craft of stonemasonry through working in his father’s studio. In 1889, he went to Paris to study at the École nationale des beaux-arts and at the Académie Julian. 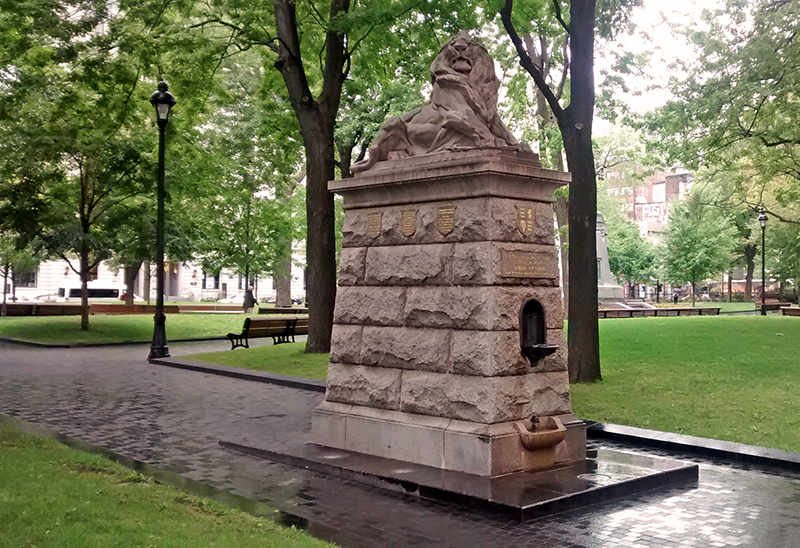 Upon returning to Montreal in 1894, he opened his own workshop and produced public memorials in partnership with architect Edward Maxwell. Two of their most well-known collaborations are the Monument aux héros de la guerre des Boers (1907) and the Sir George-Étienne Cartier Monument (1919). The first is Montreal’s only equestrian monument while the second, located in Mount Royal Park, is the most impressive monument in the city. Hill would also create Sherbrooke’s Monument aux braves, a cenotaph inaugurated in 1926 in honour of the fallen soldiers of the First and Second World Wars.